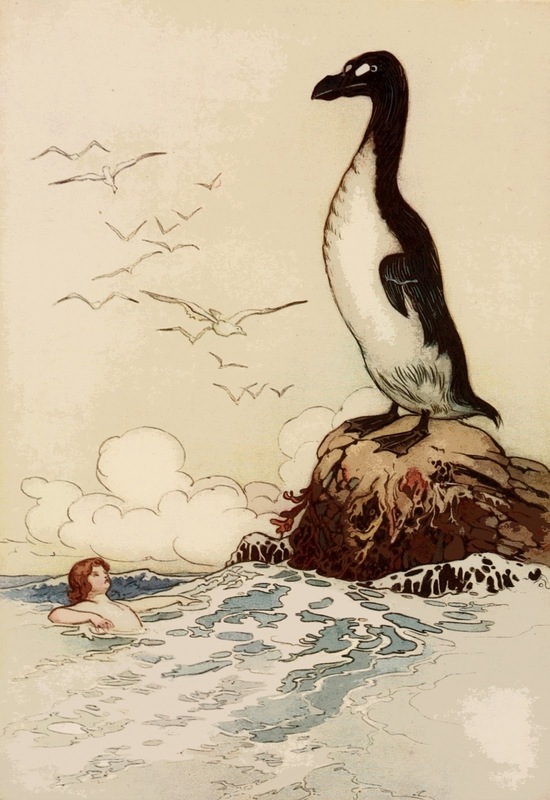 As fondly commemorated above in Charles Kingsley’s classic children’s novel The Water-Babies: A Fairy-Tale For a Land-Baby (1863), one of the most famous extinct species of modern-day bird is the great auk Pinguinus impennis, also known as the garefowl, gairfowl, or geirfugl. 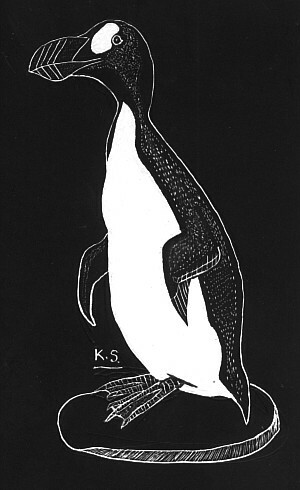 Almost 3 ft tall (the only taller auk was the prehistoric Howard’s Lucas auk Miomancalla howardi), this sturdy flightless black-and-white seabird from the northern hemisphere was superficially reminiscent of the southern hemisphere’s familiar penguins, but its link with them does not end there – because the great auk was the original penguin, the latter name having been initially bestowed upon this puffin-allied species. Only later was it applied by those European sailors first penetrating Antarctic waters to the wholly-unrelated birds that they encountered there and which retain it today, long after the original northern penguin’s extermination. In Europe, its major stronghold was the Icelandic coast, but great auks even existed around the more northerly islands of Scotland, most notably St Kilda but also visiting the Orkneys, with one particularly famous Orcadian pair being nicknamed the King and Queen. Sadly, however, they were no safer from hunting here than they had been in the New World. Moreover, it was especially ironic that as this species became rarer, it became ever more persecuted by museum collectors – anxious to add specimens and eggs to their collections before it died out! The last known pair of great auks constituted a couple that were clubbed to death (and their egg smashed) on the Icelandic island of Eldey on 3 June 1844, since when the species has long been deemed extinct (but see below). 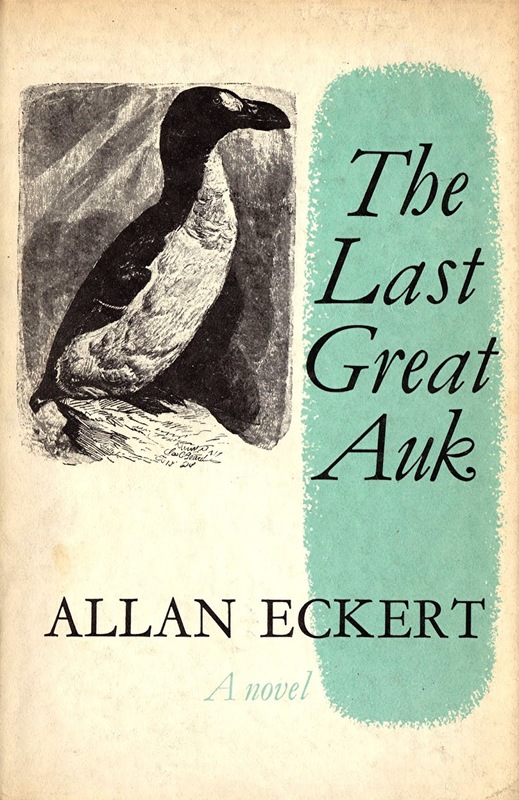 A particularly moving novel reconstructing this terrible, shameful event, entitled The Last Great Auk and first published in 1964, was written by Allan Eckert, and was reviewed by me herein an earlier ShukerNature post. 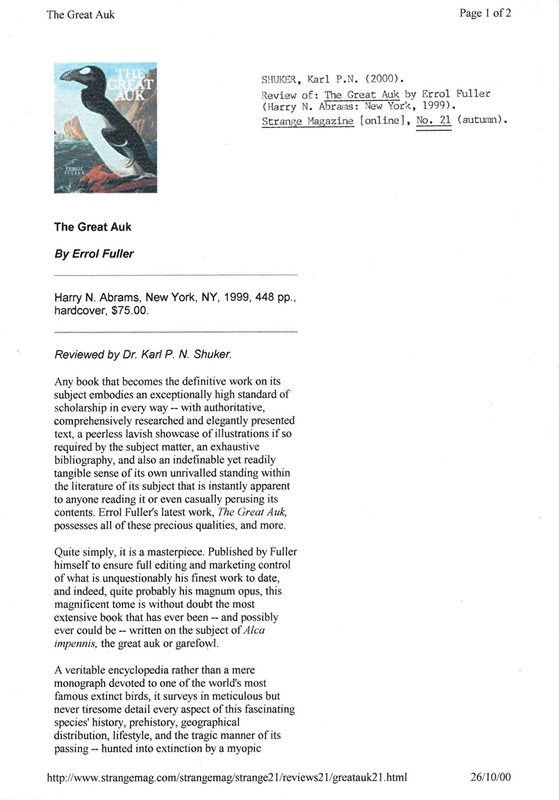 For some decades thereafter, however, various quite convincing reports of lone living specimens emerged from various remote far-northern European localities, and it is with these little-mentioned, ‘post-extinction’ reports of great auks that this present ShukerNature article is concerned. Perhaps the most (in)famous of these is also the most recent one. On 19 April 1986, London’s Daily Telegraph carried the remarkable news that an expedition was to set sail for Papa Westray, a tiny islet in Scotland’s Orkney group, in response to reputed sightings of a living great auk there. Unhappily for cryptozoology as well as for mainstream zoology, however, it proved to be more of a canard than an auk! For as documented in the International Society of Cryptozoology’s ISC Newsletter for spring 1987, it turned out to be nothing more than an imaginative advertising promotion for a certain brand of whisky, using a robotic auk! This is not the first false alarm for this long-lost species. Reports of great auks in the Lofoten Islands, an archipelago off Norway‘s northwestern coast, emerged every so often during the late 1930s. 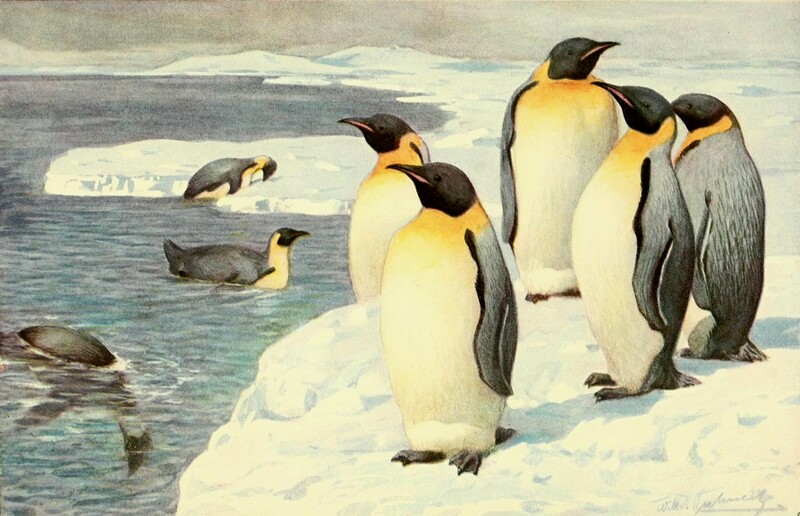 When finally investigated, however, the birds proved to be genuine penguins – namely, nine king penguins Aptenodytes patagonicus, which had been brought from sub-Antarctica as pets by whalers and had been released on the Lofotens in August 1936 when no longer wanted. The last two died there in 1944. Nevertheless there are a number of more promising reports of post-1844 survival too. 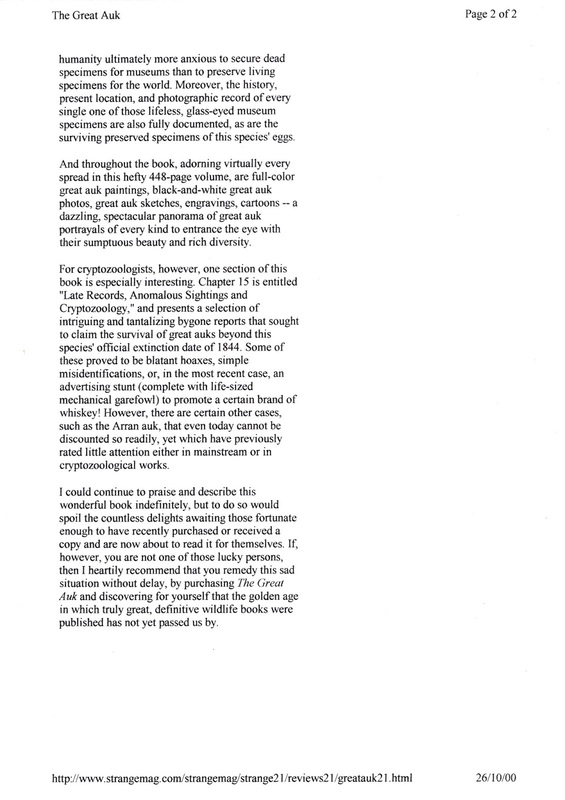 Indeed, a sighting of a single living specimen on the Grand Banks of Newfoundland in December 1852, made by eminent field naturalist and ornithologist Colonel Henry Maurice Drummond-Hay with the aid of binoculars, and at a distance of only 30 yards or so away while he was traveling aboard a steamer, has lately been formally accepted by the IUCN (International Union for Conservation of Nature and Natural Resources). It was first brought to mainstream attention in 1979 by T.R. 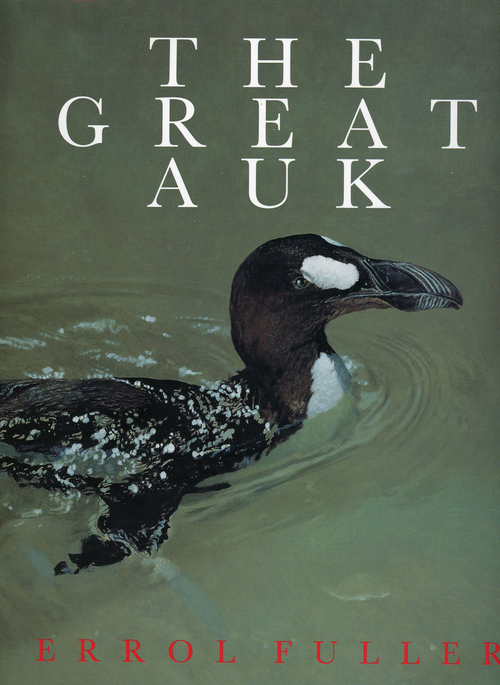 Halliday in a paper on the great auk published by the periodical Oceans. 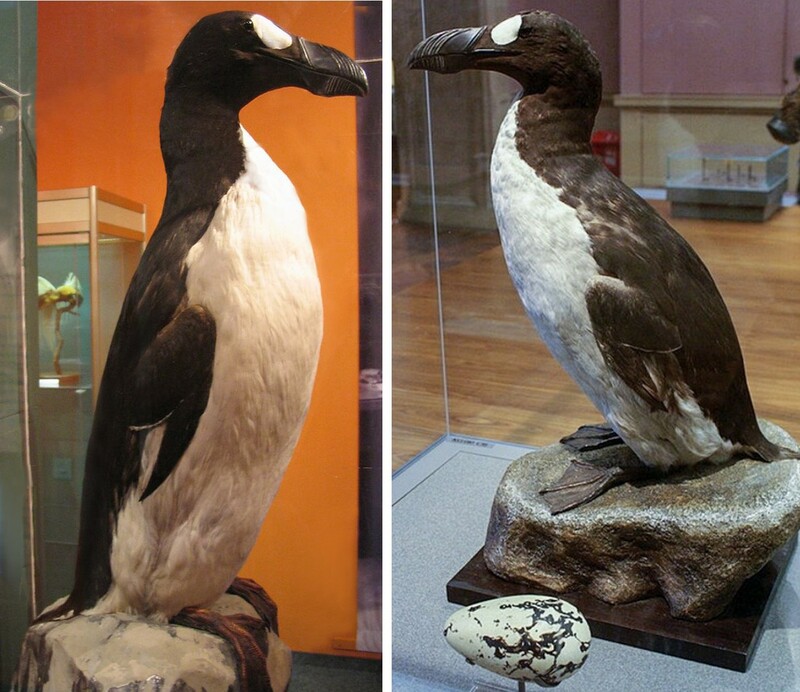 Moreover, in 1853 a dead great auk was supposedly found on the shore of Trinity Bay on Newfoundland’s eastern side, and three years later another one was reputedly caught on its western shore, but neither specimen was submitted to scientists for confirmation (or otherwise). Equally enigmatic is the taxonomic identity of the mysterious Arran auk – the name given by the elderly pilot of a boat carrying the Reverend G.C. Green around Scotland’s western coast to a strange seabird as large as a goose or turkey and with a large sharp beak, but with such short wings that it never flew, only paddled, and was black in colour dorsally, white ventrally. As the Rev. 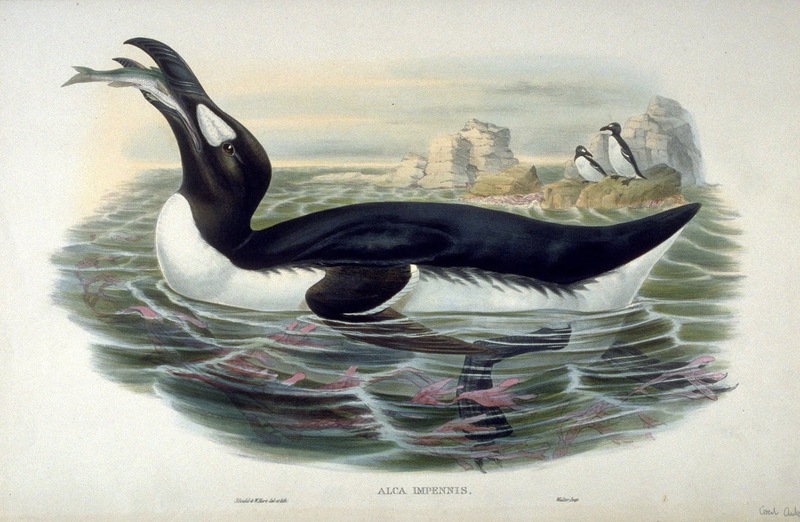 Green noted in an article by him that was published on 27 March 1880 in The Field magazine, when he showed the pilot an illustrated book of birds the latter readily identified the picture of a great auk as portraying the Arran auk. He also stated that it only appeared on the coast of western Scotland’s Isle of Arran in March each year, that he had shot three specimens, and that he would obtain one for Green the following March. For example, he notes that in 1971 the famous English nature-writer and broadcaster J. Wentworth Day recalled how back in 1927 he was informed by an acquaintance from his youth named Edward Valpy, whom he deemed to be a first-rate naturalist and explorer of unimpeachable truth, that while spending some time on one of the Lofotens he had spied a great auk slipping off a rock near the local boat-builder’s yard and quay. Day also stated that when Valpy had informed the boat-builder of what he had seen, the builder confirmed that it had been around for some time, that his sons had often seen it, and that once it had even dived beneath the boat on which he had been sailing. Note again that this was several years before the king penguins had been released here, so they cannot explain this report of multiple sightings. Sadly, Brodtkorb threw the dead bird’s carcase on the beach when he landed, then later regretted doing so, but when he returned to the beach the following day to retrieve it, it had gone, carried away by the tide. Brodtkorb’s mystery bird has since been discounted by various sceptical naturalists as having merely been a diver or some familiar auk species, but those who knew him personally vouched for his knowledge of wildlife, stating that if this is really all that it had been, as an experienced sportsman he would have readily recognised it as such. Problematically, as Errol pointed out in his book, Vardö is much further north than any currently-known locality for great auk occurrence in historical times, but its remains in prehistoric middens from this region confirm that in earlier ages it did indeed occur there. 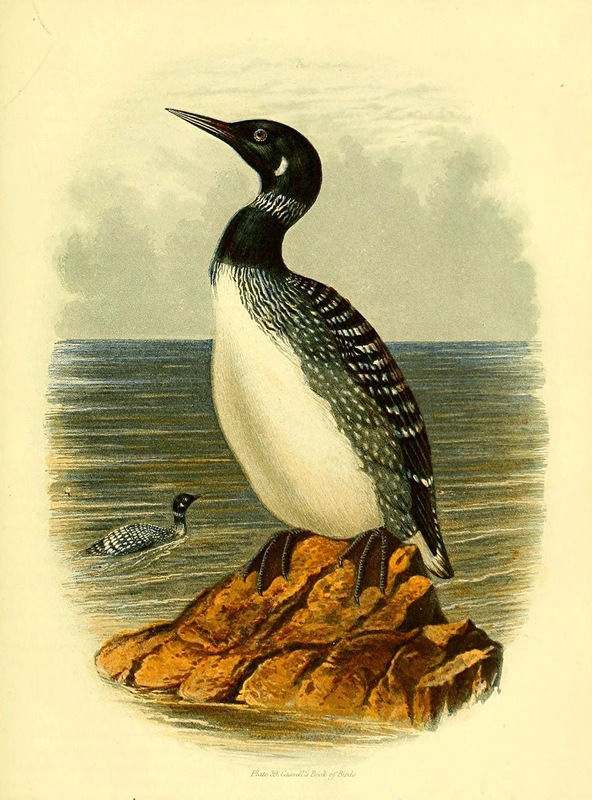 Errol’s book also contains other post-1844 claimed sightings of this species in Norwegian and Greenland localities further north than would be expected, based at least upon its confirmed historical distribution and irrespective of the sightings’ dates. Might it just be possible, however, that in such far-north localities, out of the ready reach of hunters, some few great auks did indeed survive beyond, possibly even well beyond, their species’ official extinction dates (1844/1852) – and might some even be lingering there today?